The Neos are very small, Neodymium-core active pickups that can be used individually or in groups. These are hacker friendly, general purpose pickups that can be used in a variety of applications. These are active pickups with low impedance coils and individual balanced, low-power, low-noise preamplifier for each coil. Neo1 contains a single coil with a single differential preamp. Neo2 contains two coils and dual differential preamps. And Neo6 contains six coils and six differential preamps. Low impedance coils (1300 turns, 350Ω D.C. Impedance). Modern, Low power, Low noise OPA2314 differential Op Amps. Single supply (1.8 V to 5.5 V). Premium gold-plated, 2 mm pitch header connector. Precision 1% thin-film, low TCR, low noise, Yageo and Vishay resistors. Panasonic low noise film capacitors. 35dB cross-talk (tested at 10mm coil spacing, 2mm from string). Polyphonic pseudo-differential or single-ended output. 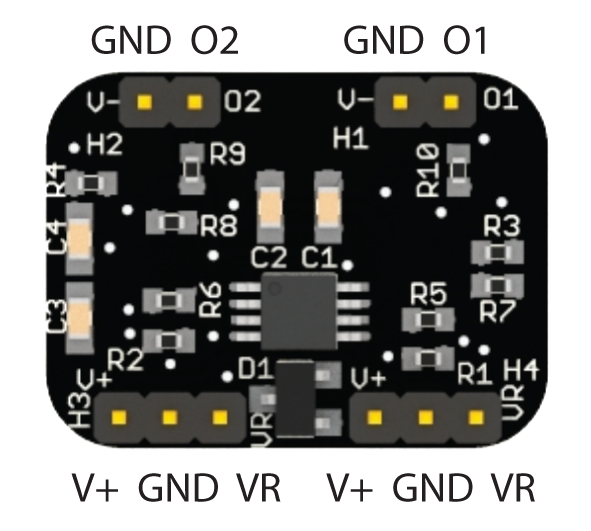 Note: Use the VRef module to supply VR (½ the supply voltage). See below. Warning: Do not exceed the supply voltage maximum (5.5 V). Never use a 9V battery. The Neo1 is not protected against over-voltage. See Power Considerations below. 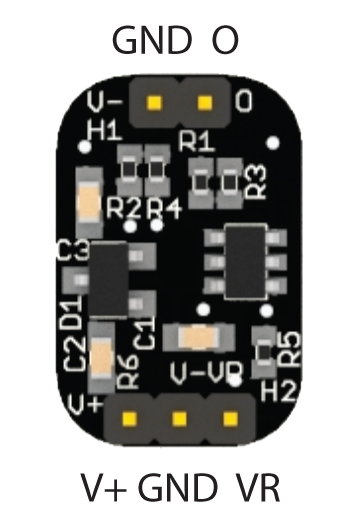 Note: Use the VRef module to supply VR (½ the supply voltage). See below. Warning: Do not exceed the supply voltage maximum (5.5 V). Never use a 9V battery. The Neo2 is not protected against over-voltage. See Power Considerations below. Neo6 is self-contained. VRO (pseudo-differential common) is generated internally and is shared by all 6 pickup preamplifiers. Warning: Do not exceed the supply voltage maximum (5.5 V). Never use a 9V battery. The Neo6 is not protected against over-voltage. See Power Considerations below. Each set of 6 Neo1 or Neo2 coils (e.g. 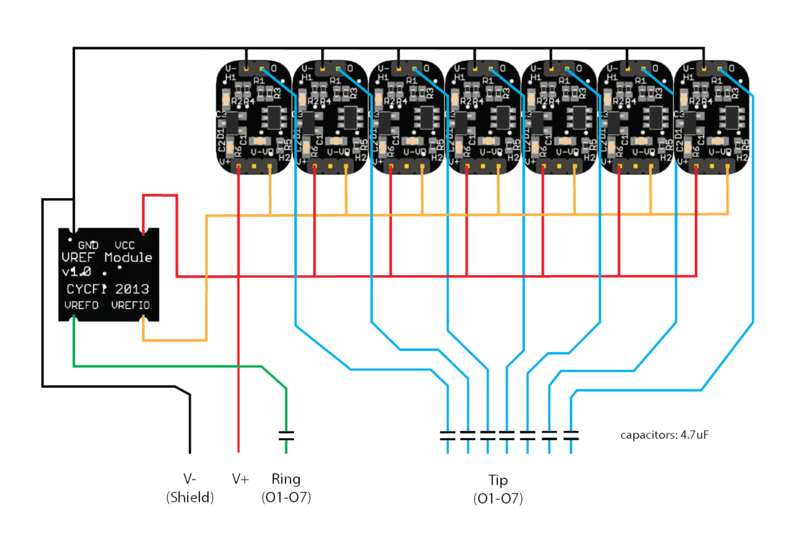 6 Neo1, 3 Neo2) VRef module that generates VR (½ the supply voltage) for Neo1 and Neo2. The output of the Neos are designed to be transmitted in a floating, pseudo-differential manner directly to the balanced inputs of the mixing board, a multi-channel computer audio interface, or analog to digital converters (ADCs). 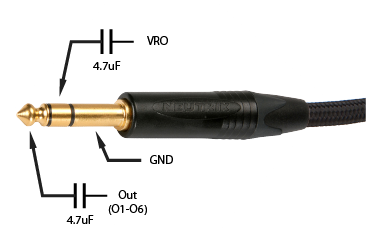 Balanced connections use three-conductor connectors per channel, where the “hot” (positive) signal is taken from the individual outputs (O1-O6) and the “cold” (negative) signal is taken from the common VRO reference. The impedances in the “hot” and “cold” lines (O1-O6 and VRO) are matched (both 10KΩ). The output of the Neos are D.C. coupled. With no signal, the difference between the output and VRO is zero (plus or minus the negligible offset voltage of the Op-Amp). 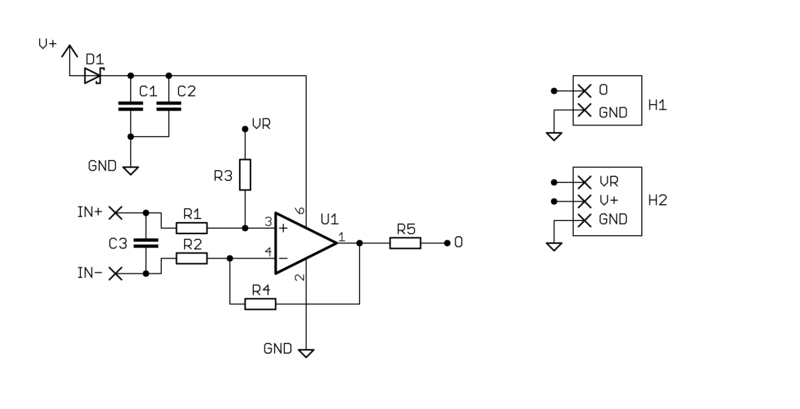 Both the outputs and VRO are biased at ½ the supply voltage with respect to ground. Differential preamplifiers should be able to cancel the D.C. bias (and most line-level preamplifiers have D.C. blocking capacitors anyway), but to be sure, and to eliminate unwanted pops when plugging and unplugging, better place a 4.7μF D.C. blocking capacitor after each Neo output and VRO to remove any D.C. bias. These capacitors, however, are not needed when connecting directly to balanced analog to digital converters (ADCs). Balanced connections give the best performance and is virtually immune to external noise. If necessary, it is OK to connect to single-ended inputs such as standard guitar amplifiers. The Neos are active pickups using modern low-power, low-noise, rail-to-rail Op Amps, rated at 5.5v max. Thus, it is not advisable to use standard 9V batteries. 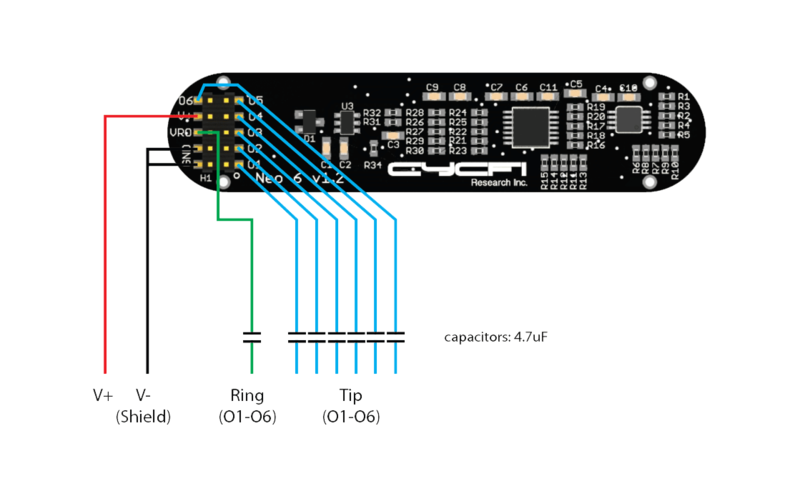 The rationale for this design decision is that modern Li-ion rated at 3.7v are superior to other types of batteries. They are rechargeable and have more juice per gram. Li-ion batteries are now commonplace and have become pretty cheap as a result. Two AA 1.5 batteries, either alkaline and rechargeable Ni-MH will work as well since the Op Amps can go to as low as 1.8 V. Finally, since the Op Amps are very low power, it is also possible to use super capacitors. They are more expensive, but can be charged very quickly. The Neo is entirely Open Source. 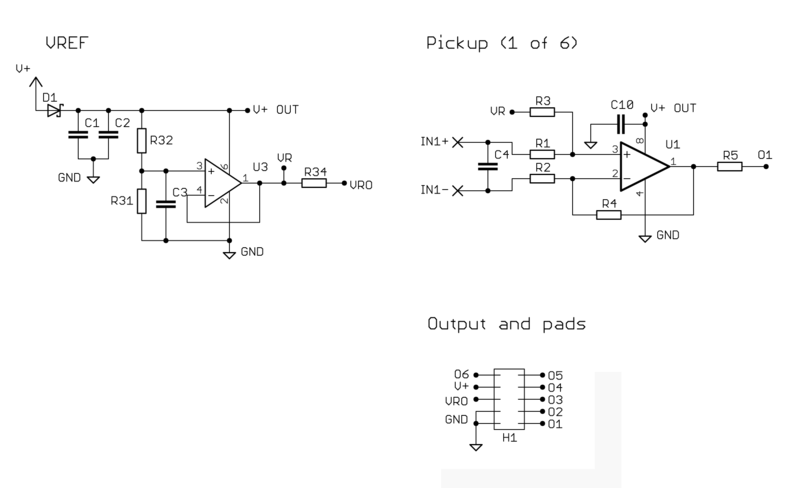 The designs (schematics, PCB layout, software, bill of materials, CAD drawings and source code) are freely shared, 100% free, under the Creative Commons Attribution-ShareAlike 4.0 International License. That means you can use the designs in your own projects, even commercial ones.